Santiago Calatrava has unveiled new designs for the Chicago Spire - a 150-storey condiminum tower proposed for Lake Shore Drive (via Archidose). The Spanish-born engineer unveiled his latest refinements to the controversial design in Chicago on Monday. 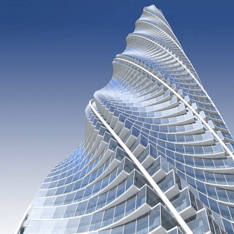 If built, the 2,000ft tower will contain around 1300 luxury apartments. More on the tower in the Chicago Tribune.